Teamwork….St Helens Council Chief Executive Mike Palin (left) with Paul Hubball from Orbit Developments. St Helens Council Leader Barrie Grunewald has welcomed news that two more high-profile retailers will be arriving on the flagship West Point site in the town centre. Both Costa Coffee and Bella Italia have confirmed they will be moving into premises at the new development – joining supermarket giant Aldi which opened its doors to the public in May. And in a further boost to the borough’s leisure offer, hopes are high that details will soon be confirmed for a new bowling alley on the 5.3 acre site. 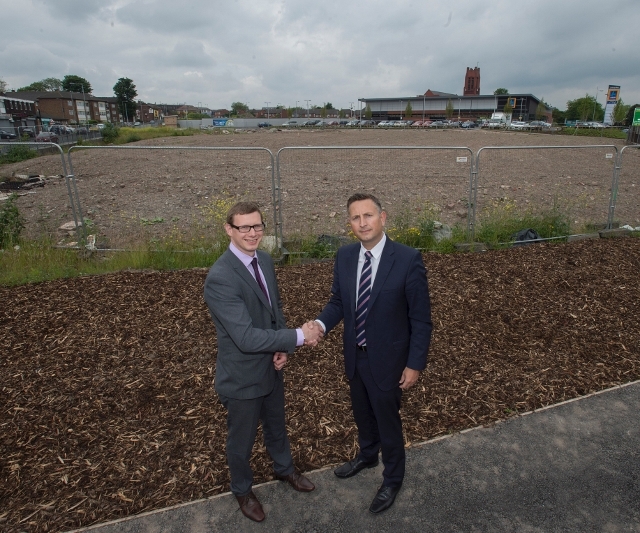 Council Leader Barrie Grunewald said: “This site was derelict for a long time but now we can all see how it is being brought back to life with an exciting retail and leisure offer that further strengthens the town centre. The site is being developed by Orbit Developments, whose Senior Development Manager Paul Hubball said: “Development on the West Point site has stalled in the past, but since the development partnership between Orbit and the council was created, we’re pleased to see commercial development progressing well.